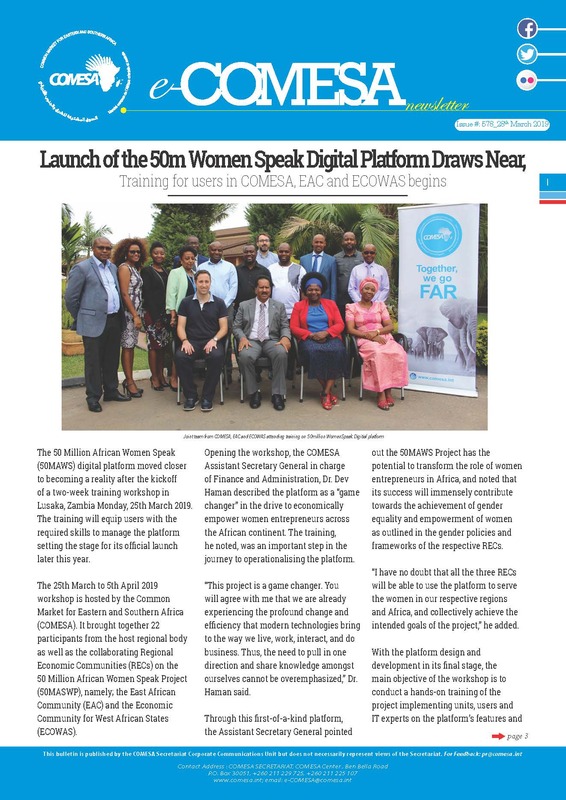 Lusaka, Friday, April 5, 2019: COMESA Secretariat has received a combined development aid amounting USD 299 million from the development partners to support different COMESA programmes as it marks 25 years of its existence this year. According to the Secretary General Chileshe Kapwepwe, the trust was earned after the Secretariat passed the 4 and 7 Pillars Assessment of the European Union (EU) in 2005 and 2015 respectively. Qualification under the pillar assessment allows the organization to use its own financial and procurement procedures in the utilization of funds received from development partners. Speaking during the opening of the 7th Extraordinary Council of Ministers meeting that took place in Lusaka, Zambia, today, Ms. Kapwepwe explained that COMESA has since 1994 strived to improve its procedures and processes on a continuous basis to comply with international norms, standards and practices. It is the first regional economic community to quality for this status. The leading financier to COMESA is the European Union. Others are the USAID, African Development Bank, World Bank and DFID and others. The EU alone has disbursed around USD 277 million to assist in the implementation of Regional Integration Support Mechanism (RISM), Regional Integration Support programme (RISP), Climate Change Initiative, African Peace and Security Architecture Programme (APSA) and Maritime Security (MASE). Under the RISM Programme, a total of USD104.2m out of the USD140 million has been disbursed to Member States. The balance is being disbursed under the 8th Call, starting from the beginning of this year. “These financial resources have greatly assisted Member States to implement the COMESA Regional Integration Agenda and specifically support value chains in cotton, leather and edible oils,” Ms Kapwepwe added. She revealed that from 2018 onwards, COMESA is focusing on Trade facilitation programmes which include border management, Non-tariff Barriers, facilitating small scale cross borders, increasing private sector participation and enhancing programmes in value chains. Efforts have also been implemented to further enhance operations and governance of the COMESA Secretariat. A capacity building programme is being designed to undertake a through business process reengineering of the policies, procedures and processes to better deliver on its mandate. 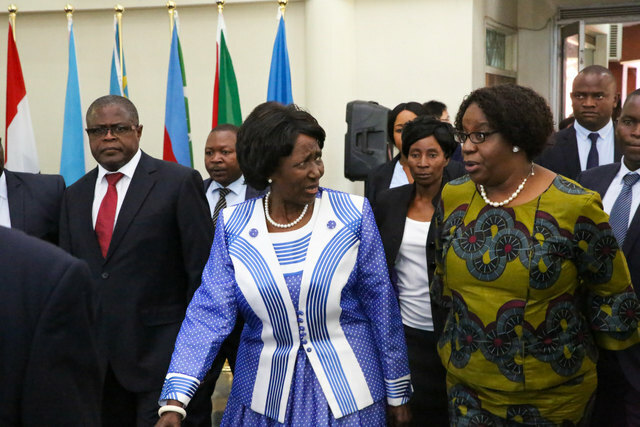 Speaking when officially opening the Meeting, Zambia’s Vice President Her Honor Inonge Wina commended the cooperating partners for the support but urged the Member States to strive to mobilise resources from within the region. “…In this way, COMESA activities will be more sustainable while the goodwill of our partners goes to supplement our efforts,” she urged. Mrs Wina called on the countries to fully support COMESA’s efforts in having digital economic integration by harmonising cross border activities, systems and transactions which will lead to a digital Free Trade Area. She urged the Member States to quickly ratify the Tripartite Free Trade Area whose deadline falls this month of April. Further, she commended COMESA for implementing the 50 Million African Women Speak Project which will further enhance access to finance, markets and related services to women in business. The extraordinary meeting brought together Ministers of Trade and Industry from the region to address audit and financial matters and take stock of the progress regarding implementation of some regional integration programmes such as the COMESA-EAC-SADC Tripartite Free Trade Area. Permanent and Principal Secretaries, Ambassadors and High Commissioners, Special Representatives to COMESA and Directors of Trade attended the meeting. Others present were the heads of COMESA institutions namely the Court of Justice, the COMESA Competition Commission and the Federation of Women in Business (FEMCOM). COMESA marks 25 years on 8th December 2019 since it was establishment as a successor to the Preferential Trade Area (PTA).